Daikan is one of the 24 solar terms.The 24 solar terms is the calendar that had been used in China with one year divided into 24 seasons. Since it is made to fit the seasons in China and being the lunar calendar as well,there is a slight gap between the climate of today. However, up to certain period,it was the important basis to know the time for Japanese agricultural labors and it also had been considered useful as seasonal yardstick in daily life. 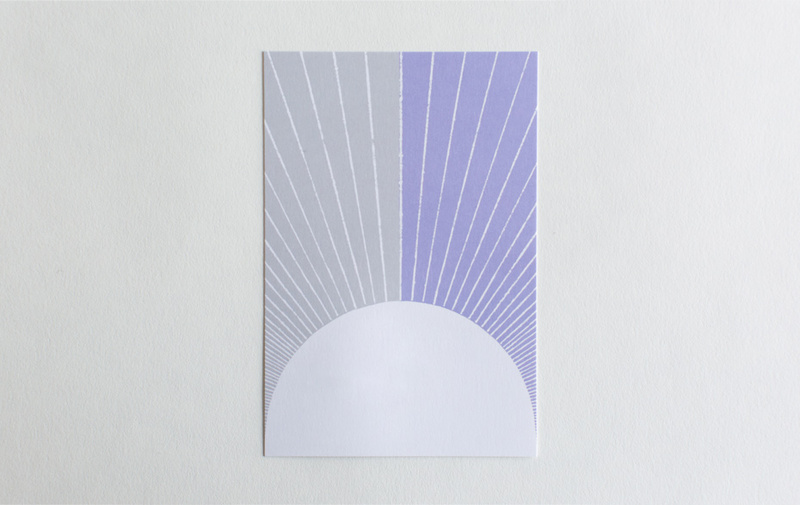 Daikan, written with two characters meaning "big" and "cold",literally expresses the coldest season in a year.The names of the 24 solar terms, such as Daikan, express seasons intelligibly by two characters,thus give us lasting impressions. 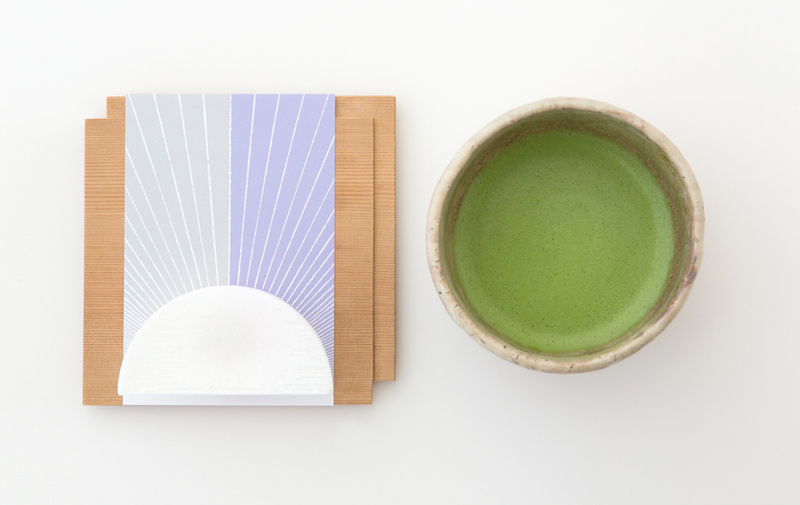 Kanchu-mimai, cold season's greetings,is a greeting word during the period between Daikan and the preceding Shokan; in such way, it is still alive today in daily lives of Japanese people. 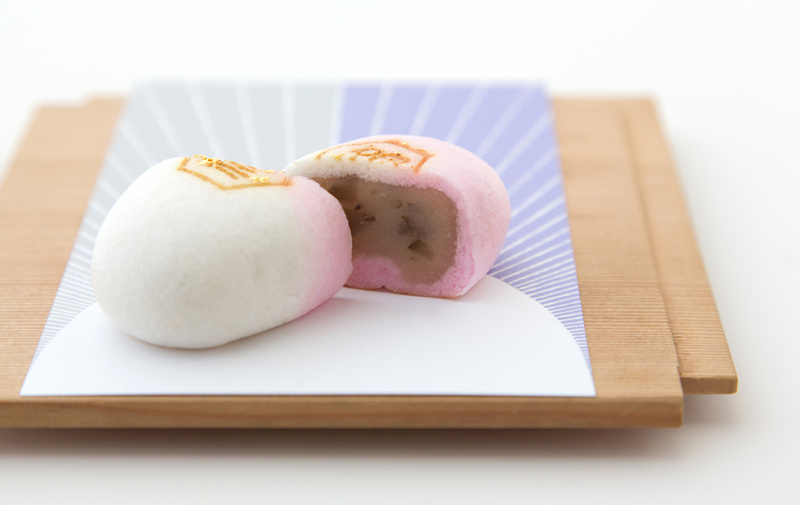 In Kyoto, there is a custom in January to eat a celebratory New Year's confection, "Hanabira-mochi", flower petal cake.Burdock, shiromiso-an (sweetened bean paste in white soybean paste flavor) and pink mochi (rice cake) are wrapped in either mochi or gyuhi (starch paste). 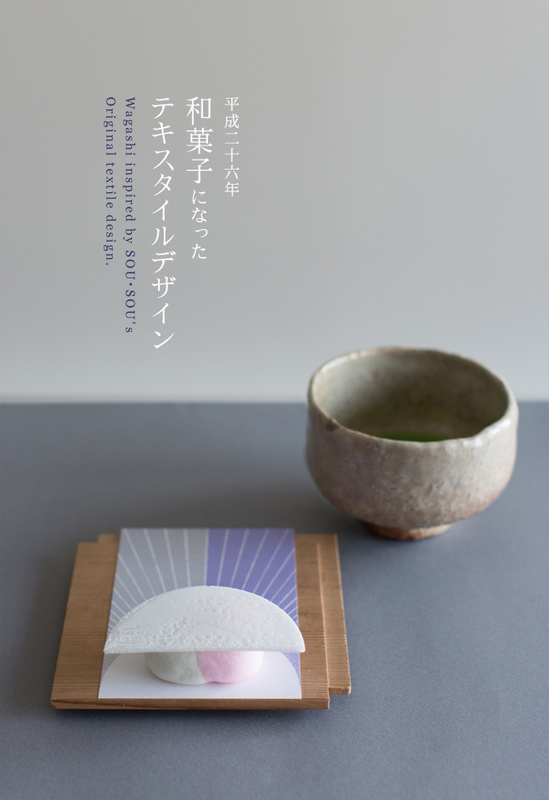 It is the confection for Urasenke's Hatsugama (the first tea ceremony of the New Year), a wagashi with high social standing.For the first "Wagashi inspired by SOU・SOU's original textile design" of the year, we created a confection associated with this Hanabira-mochi. Sweet boiled burdock is placed inside of miso-an and wrapped not by mochi but the dough of joyo-manju (steamed yam bun with sweetened bean paste inside). It is colored in red and white with a brand mark of the character "Fuku", good luck, and gold dust is sprinkled. 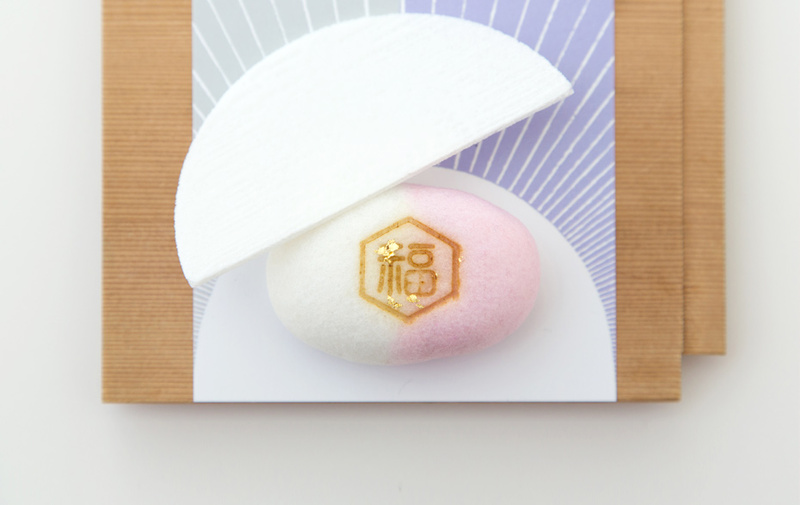 On top, a half-moon shaped suri-mitsu (fondant) rice cracker is placed in association with the textile.